The chromosomal high mobility group box-1 (HMGB1) protein acts as a proinflammatory cytokine when released in the extracellular environment by necrotic and inflammatory cells. In the present study, we show that HMGB1 exerts proangiogenic effects by inducing MAPK ERK1/2 activation, cell proliferation, and chemotaxis in endothelial cells of different origin. Accordingly, HMGB1 stimulates membrane ruffling and repair of a mechanically wounded endothelial cell monolayer and causes endothelial cell sprouting in a three-dimensional fibrin gel. In keeping with its in vitro properties, HMGB1 stimulates neovascularization when applied in vivo on the top of the chicken embryo chorioallantoic membrane whose blood vessels express the HMGB1 receptor for advanced glycation end products (RAGE). Accordingly, RAGE blockade by neutralizing Abs inhibits HMGB1-induced neovascularization in vivo and endothelial cell proliferation and membrane ruffling in vitro. Taken together, the data identify HMGB1/RAGE interaction as a potent proangiogenic stimulus. High mobility group box-1 (HMGB1)4 is a widely expressed member of the HMGB family of chromosomal proteins (1). It exerts nuclear functions by interacting with specific DNA structures or after recruitment by various DNA binding proteins (1). Recent studies have demonstrated surprising cytokine-like roles for extracellular HMGB1 (2). Indeed, HMGB1 released by injured or necrotic cells acts as a signaling molecule, inducing local inflammatory responses (3). Also, HMGB1 is actively secreted by monocytes stimulated by cytokines and LPS (4). In turn, extracellular HMGB1 regulates cytokine expression (5, 6) and promotes inflammatory cell recruitment (3, 5). Moreover, HMGB1 stimulates the migration of adherent cells, such as fibroblasts and smooth muscle cells (7). Thus, extracellular HMGB1 can be regarded as both a signal of tissue injury and a mediator of inflammation. In target cells, extracellular HMGB1 triggers the activation of the members of the MAPK pathway ERK1/2. Also, cytoskeleton reorganization induced by HMGB1 in smooth muscle cells requires the activity of small G proteins (7, 8). These data point to the presence of cell membrane receptor(s) for HGMB1. Indeed, binding of HMGB1 to the receptor for advanced glycation end products (RAGE) induces cell migration, cell invasion, tumor growth, and metastasis (4, 7, 9). Also, the involvement of the cell surface heparan-sulfate proteoglycan syndecan-1 and of TLRs 2 and 4 in cellular activation by HGMB1 has been demonstrated (4, 10, 11). Angiogenesis, the growth of new blood vessels from pre-existing ones, plays an important role in various pathological settings, including inflammation, wound repair, and tumor growth (12). Various cytokines and chemokines exert a proangiogenic activity by acting directly on endothelial cells or indirectly by inducing the production of angiogenic growth factors by inflammatory cells (13, 14, 15). Given its cytokine/chemokine-like features, we investigated the capacity of HMGB1 to modulate the different steps of the angiogenesis process in vitro and its proangiogenic activity in vivo. The results identify HMGB1 as a potent angiogenic molecule. Eukaryotic recombinant HMGB1 was purified to homogeneity as described previously (16). The amount of LPS in HMGB1 preparations was equal to 2–3 pg/μg protein. At these concentrations, LPS does not exert any effect in the biological assays used in the present work. Recombinant fibroblast growth factor-2 (FGF2) was expressed and purified from Escherichia coli cell extract (17). Neutralizing polyclonal anti-RAGE Ab (AF1179) was from R & D Systems. Fetal bovine aortic endothelial GM7373 cells (17) were grown in DMEM containing 10% FCS (Invitrogen Life Technologies). Immortalized BALB/c murine aortic endothelial (MAE) cells were grown in DMEM (Invitrogen Life Technologies) added with 10% FCS. Murine lung microvascular endothelial cells (1G11 cells) (18) were grown in DMEM supplemented with 1% nonessential amino acids and 20% FCS on gelatin-coated dishes. Subconfluent cell cultures were seeded in 24-well plates and incubated for 16 h at 37°C in serum-free DMEM. 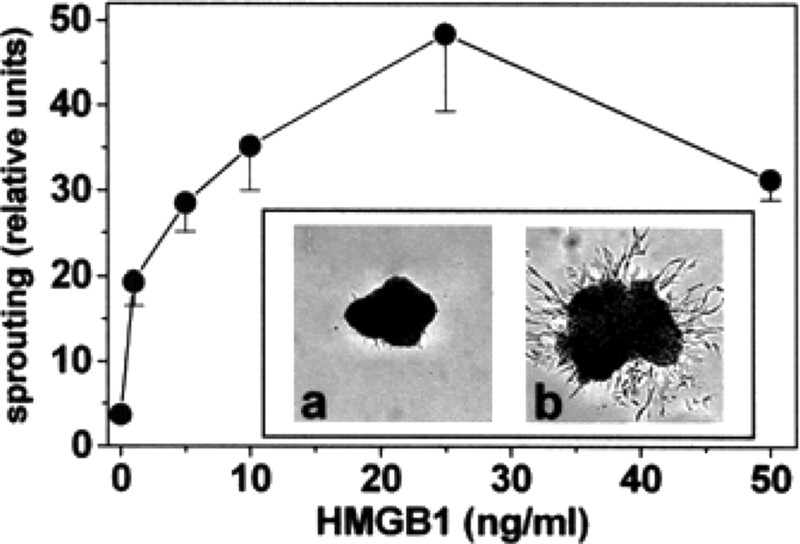 Then, cells were treated with HMGB1 without changing the medium. After 30 min at 37°C, Western blot analysis of the cell extracts was performed using anti-phospho-ERK1/2 Ab (Santa Cruz Biotechnology). Immunocomplexes were visualized using the ECL Western blotting kit (Amersham Biosciences). GM7373 cells were seeded at 70,000 cells/cm2 in 96-well dishes. After overnight incubation, cells were treated with HMGB1 in fresh medium containing 0.4% FCS. After 24 h, cells were trypsinized and counted in a Burker chamber. MAE cell aggregates were prepared on agarose-coated plates and embedded in fibrin gel (17). Then, culture medium containing HMGB1 was added on the top of the gel in the presence of 10 μg/ml aprotinin. After 48 h, sprouts were photographed at ×40 magnification and quantified by computerized analysis of the digitalized images (17). GM7373 cell monolayers were wounded with a 1.0-mm-wide rubber policeman and incubated in fresh medium added with 0.4% FCS and increasing concentrations of HMGB1. After 3 h, the percentage of cells at the edge of the wound showing cell membrane ruffles was counted under a inverted microscope at ×400 magnification. After 24 h, wounds were photographed, and denuded wounded area was quantified by computerized analysis of the digitalized images (17). Cells were seeded at 1.0 × 106 cells/ml in the upper compartment of a Boyden chamber containing gelatin-coated polyvinylpyrrolidone-free polycarbonate filters (5-μm pore size; Costar). Increasing concentrations of HMGB1 dissolved in DMEM with 1% FCS were placed in the lower compartment. After 4 h of incubation at 37°C, cells migrated to the lower side of the filter were stained with Diff-Quik (Dade-Behring). Five random fields were counted for each triplicate sample. Alginate beads (5 μl) containing vehicle, 300 ng of HMGB1 with or without 100 ng of neutralizing anti-RAGE Ab were prepared as previously described (19) and placed on top of the CAM of fertilized White Leghorn chicken eggs at day 11 of incubation. After 72 h, blood vessels converging toward the implant were counted at ×50 magnification. Next, paraffin-embedded longitudinal CAM sections were processed for light microscopy (H & E) and immunostaining using a monoclonal anti-RAGE Ab (Chemicon International). Data are the mean ± SD of two to three independent experiments in triplicate. Statistical analyses were done using Student’s t test. HMGB1 induces a proangiogenic response in endothelial cells in vitro. Angiogenesis begins with the degradation of the basement membrane by activated endothelial cells that will migrate and proliferate, leading to the formation of solid sprouts into the stroma. Then, vascular loops are formed and capillary tubes develop (20). In vitro assays have been developed to mimic the different steps of the angiogenesis process. However, a high degree of heterogeneity exists for endothelial cells from different sources (21). On this basis, to assess the proangiogenic potential of HMGB1, the purified eukaryotic recombinant protein was evaluated for the capacity to induce a proangiogenic response in different in vitro assays using large-vessel and microvascular endothelial cells of murine and bovine origin. As shown in Fig. 1⇓A, recombinant HMGB1 causes the activation of intracellular ERK1/2 signaling in bovine aortic endothelial GM7373 cells in a dose-dependent manner. A similar effect was observed in murine endothelial MAE cells (data not shown). 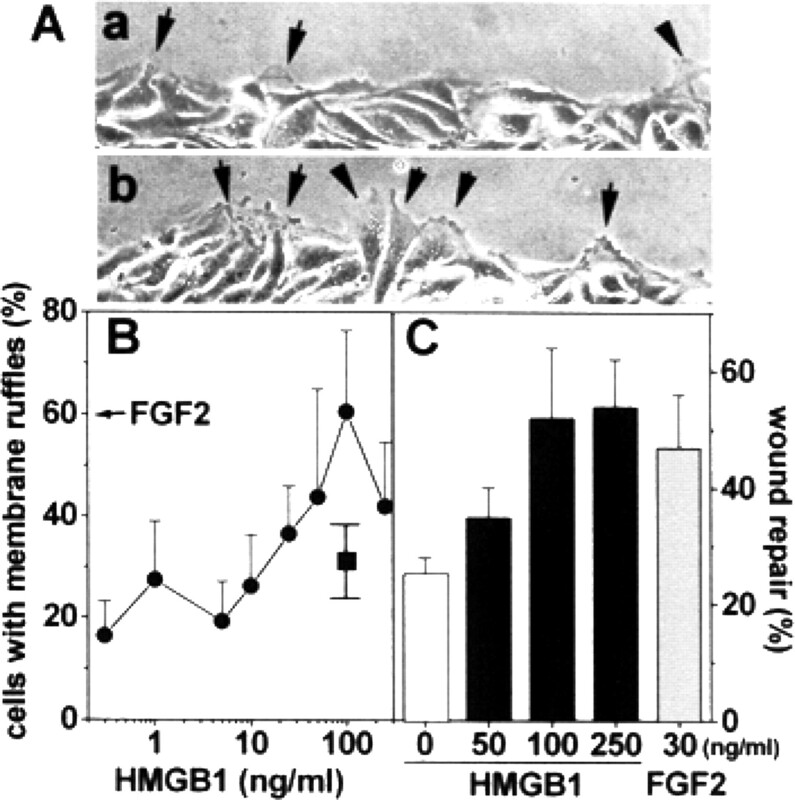 Also, HMGB1 induces a significant mitogenic response in GM7373 cells similar to that exerted by the angiogenic growth factor FGF2, maximal stimulation being observed at 25–50 ng/ml HMGB1 (Fig. 1⇓B). The effect was inhibited by blocking Abs directed against the HMGB1 receptor RAGE but not by irrelevant IgGs (Fig. 1⇓B). HMGB1 stimulates endothelial cell proliferation. 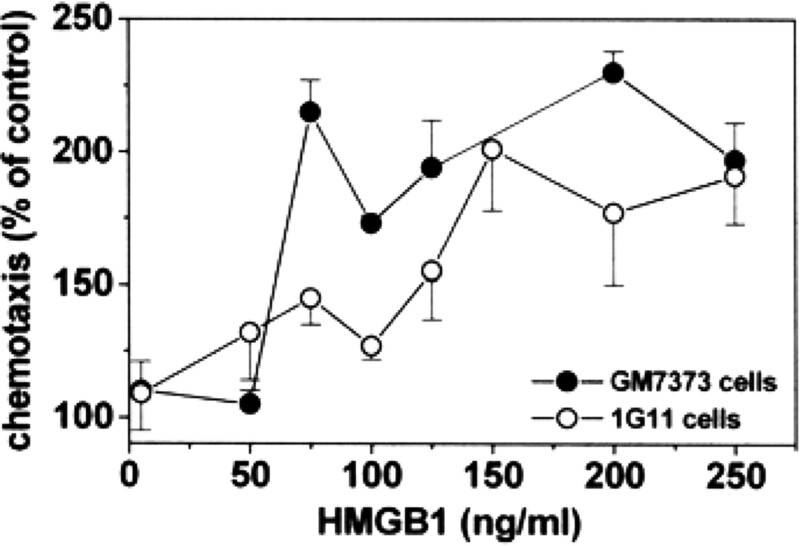 A, GM7373 cells were stimulated for 30 min with increasing concentrations of HMGB1 or with FGF2 (30 ng/ml). Cell extracts were analyzed by immunoblotting for ERK1/2 phosphorylation. Uniform loading of the gel was confirmed by immunoblotting with anti-tubulin Ab. B, GM7373 cells were counted 24 h after stimulation with FGF2 (30 ng/ml, arrow) or with HMGB1 in the absence (•) or in the presence of 20 μg/ml blocking anti-RAGE Abs (▪) or irrelevant IgGs (□). Cells maintained in 0.4% FCS undergo 0.2 cell population doublings in 24 h.
HMGB1 exerts chemotactic activity for different cells types of mesodermal origin (7). Accordingly, HMGB1 induces the migration of GM7373 and murine microvascular 1G11 cells when tested in a Boyden chamber assay (Fig. 2⇓). The effect was dose dependent, maximal response being observed at 75 and 150 ng/ml for GM7373 and 1G11 cells, respectively. Also, HMGB1 stimulates the formation of endothelial cell sprouts from aggregates of MAE cells embedded in a three-dimensional fibrin gel, maximal effect being observed at 25 ng/ml of the cytokine (Fig. 3⇓). HMGB1 induces endothelial cell chemotaxis. GM7373 (•) and 1G11 (○) cells were assessed for their capacity to migrate in response to HMGB1 in a Boyden chamber assay. After 4 h, cells that migrated to the lower side of the filter were counted, and data were expressed as percentage of cells migrated in the absence of a chemotactic stimulus. HMGB1 induces endothelial cell sprouting. MAE cell aggregates embedded in fibrin gel were incubated for 48 h in the presence of HMGB1, photographed at ×40 magnification, and sprouting was quantified by computerized analysis of the digitalized images. Inset, Representative images of cell aggregates in the presence of vehicle (a) or 25 ng/ml HMGB1 (b). Migration of endothelial cells following the mechanical wounding of the cell monolayer is characterized by cytoskeleton reorganization and formation of cell membrane ruffles (17). In keeping with its motogenic activity, HMGB1 stimulates the formation of membrane ruffles in GM7373 cells at the edge of the wound (Fig. 4⇓, A and B). This was followed by the more rapid repair of the HMGB1-treated monolayer when compared with vehicle-treated cells (Fig. 4⇓C). In both assays, the stimulation exerted by HMGB1 was similar to that shown by FGF2. Again, HMGB1-mediated membrane ruffle formation was prevented by blocking anti-RAGE Abs (Fig. 4⇓B). HMGB1 stimulates the repair of a wounded endothelial cell monolayer. Wounded GM7373 cell monolayers were incubated with HMGB1 in the absence or in the presence of 20 μg/ml blocking anti-RAGE Abs (▪) or FGF2 (30 ng/ml) plus 0.4% FCS. After 3 h, migrating cells at the edge of the wound were photographed (A), and the percentage of cells showing cell membrane ruffles was evaluated (•) (B). After 24 h, the residual denuded area was quantified by computerized analysis (C). 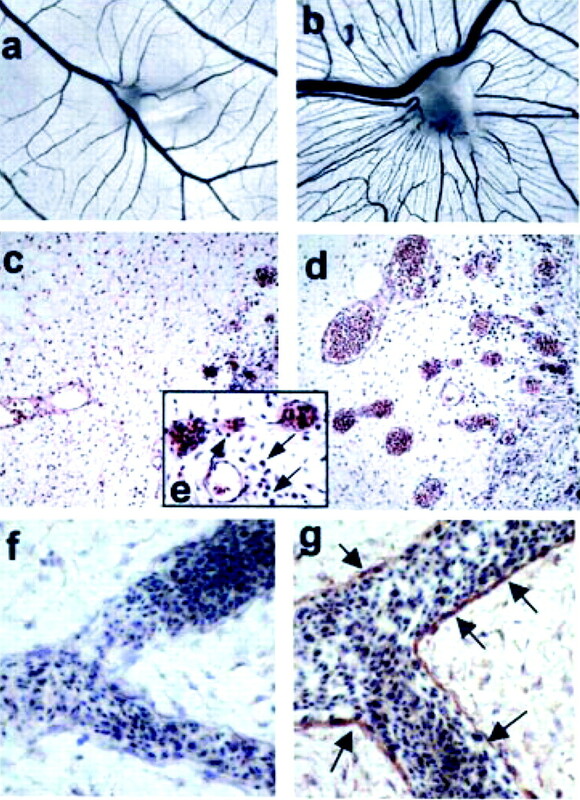 A, Representative images of vehicle-treated (a) and HMGB1-treated (100 ng/ml) cells (b) at the wound edge (arrows: membrane ruffles). In conclusion, HMGB1 induces a complex proangiogenic response in cultured endothelial cells characterized by activation of ERK1/2 signaling, cell proliferation, migration, and endothelial cell sprouting. To assess the proangiogenic activity of HMGB1 in vivo, HMGB1-loaded alginate beads were implanted onto the chicken embryo CAM at 11 days of development. After 72 h, a robust angiogenic response was observed around the HMGB1 implants when compared with vehicle-treated embryos (Fig. 5⇓, a and b). The number of macroscopic blood vessels converging toward the alginate pellets was equal to 28 ± 7 and 10 ± 7 for HMGB1 (n = 19) and vehicle (n = 15) implants, respectively (p < 0.0001). To evaluate the possibility that HMGB1 may exert an indirect effect on angiogenesis by recruiting a proinflammatory infiltrate, we performed histological analysis of HMGB1-treated CAMs. H & E staining of CAM sections confirmed the potent proangiogenic activity of HMGB1 as evidenced by numerous blood vessels filled with nucleated avian erythrocytes (Fig. 5⇓, c and d). A limited mononuclear cell infiltrate was detectable in the surrounding mesenchyma when compared with vehicle-treated CAMs (Fig. 5⇓e). This is in keeping with previous observations on FGF2-treated CAMs in which scattered infiltrating mononuclear cells can be observed (22), but it differs significantly from the massive mononuclear cell infiltrate that parallels the angiogenic response elicited in the same experimental model by the inflammatory cell chemoattractants osteopontin (22) and IL-8 (M. Presta and D. Ribatti, unpublished observations). HMGB1 stimulates angiogenesis in the chick embryo CAM. Macroscopic images of CAMs treated with vehicle (a) or 300 ng of HMGB1 (b). Note the robust neovascular response converging toward the HMGB1 implant. Histological analysis (H&E) of CAM sections shows numerous blood vessels filled with nucleated avian erythrocytes (d, ×200 magnification) and scattered infiltrating mononuclear cells (arrows in e, ×400 magnification) in HMGB1-treated CAMs compared with controls (c). Immunoperoxidase staining of CAM blood vessels (arrows) using an anti-RAGE mAb (g). The negative control in which the primary Ab was omitted is shown in f (H&E counterstaining, ×400 magnification). Finally, immunostaining of CAM sections demonstrated the expression of the HMGB1 receptor RAGE on the surface of endothelial cells (Fig. 5⇑, f and g). Accordingly, blocking anti-RAGE Abs (100 ng/implant) prevented the angiogenic response elicited by HMGB1 in five of six embryos tested in which the number of newly formed macroscopic blood vessels was reduced to 14 ± 4, similar to vehicle-treated CAMs (see above). No effect was instead exerted by irrelevant IgGs (27 ± 4 vessels/implant, n = 4). In the present work, we demonstrate for the first time that extracellular HMGB1 induces a proangiogenic phenotype in endothelial cells and triggers a potent angiogenic response in vivo in the chick embryo CAM. Similar to proangiogenic growth factors and cytokines, HMGB1 causes activation of ERK1/2 intracellular signaling that is paralleled by a significant increase in the rate of growth of endothelial cells in vitro. Also, HMGB1 induces endothelial cell chemotaxis and an increase in cell motility in a wounded endothelial cell monolayer. Accordingly, HMGB1 stimulates the formation of endothelial cell sprouts in a three-dimensional fibrin gel. In keeping with its ability to induce a complex proangiogenic phenotype in vitro, HMGB1 exerts a robust angiogenic response when delivered on the top of the chick embryo CAM. A recent report demonstrating the capacity of HMGB1 to stimulate human endothelial cell migration within collagen gel (23) further strengthens our observations. Extracellular HMGB1 interacts with cell surface receptors, including RAGE (4). 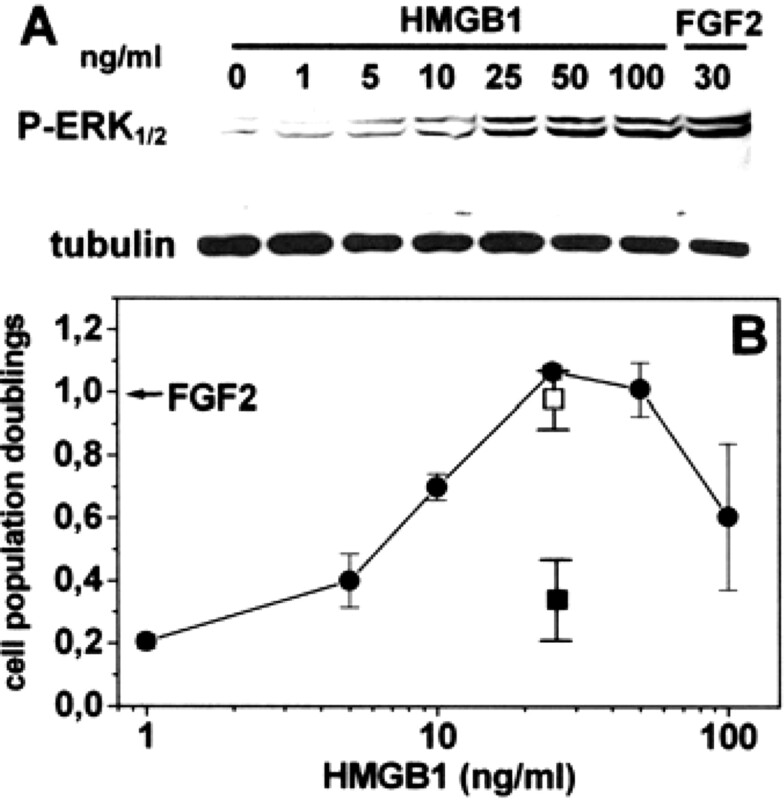 HMGB1/RAGE interaction activates parallel signaling pathways, including ERK1/2 and NF-κB activation (4), both involved in angiogenesis (24, 25). Accordingly, the ability of RAGE ligands advanced glycation end products to induce angiogenesis has been demonstrated (26). Thus, it is conceivable that RAGE may mediate the proangiogenic activity of HMGB1. Indeed, our data demonstrate that blocking anti-RAGE Abs inhibit the capacity of HMGB1 to trigger cell proliferation and membrane ruffling in endothelial GM7373 cells in vitro and neovascularization in vivo in the chick embryo CAM whose blood vessels express RAGE. In keeping with this hypothesis is also the observation that RAGE mediates endothelial cell activation (27), smooth muscle cell migration (7), and mesoangioblast migration and proliferation triggered by extracellular HMGB1 (28). In contrast, HMGB1 can interact with TLRs (4, 10) that play an important role in mediating neovascularization during activation of the innate immune response (29). Also, HMGB1 binds syndecan-1, a cell surface heparan-sulfate proteoglycan whose involvement in angiogenesis is well established (30). Thus, the possibility that other receptors, together with RAGE, may contribute to the angiogenic activity of HMGB1 cannot be ruled out. HMGB1 is released by injured or necrotic cells and actively secreted by activated macrophages (Refs.1 , 2 , 4 and references therein). In turn, extracellular HMGB1 induces the secretion of proangiogenic cytokines (e.g., TNF-α and IL-8) (4). Thus, HMGB1 may induce angiogenesis by interacting directly with endothelial cells (as suggested by our observations) and/or by stimulating the recruitment and activation of proangiogenic inflammatory cells (as indicated for different cytokines (13, 14, 15)). Histological analysis of the chick embryo CAM has shown the presence of a limited mononuclear cell infiltrate in HMGB1-treated embryos similar to that found in FGF2-treated CAMs (22). This suggests that CAM neovascularization is triggered mainly by a direct interaction of HMGB1 with endothelium rather than by an indirect effect mediated by activated inflammatory cells. This differs from previous data about the indirect, macrophage-mediated angiogenic response elicited by osteopontin in the same experimental model (22). Clearly, we cannot rule out the possibility that monocyte recruitment and activation may play a significant role in HMGB1-triggered vascularization under different experimental conditions as well as in acute and chronic inflammatory diseases, including neoplasia (23). The intracellular abundance of HMGB1 and its proinflammatory activities suggest that its release/secretion at sites of tissue damage may play an important role during inflammatory/immune responses (4). Given the importance of neovascularization at the site of injured tissue, where blood flow restoration is often a necessary prerequisite for mounting an initial immune response to pathogens and for subsequent initiation of a successful repair of wounded tissue (29), the capacity of extracellular HMGB1 to exert a potent angiogenic activity strengthens the importance of HMGB1 as a cytokine. ↵1 This work was supported by grants from MIUR (Centro di Eccellenza IDET, FIRB 2001, Cofin 2004), the Fondazione Berlucchi, Istituto Superiore di Sanità (Progetto Oncotecnologico), and the Associazione Italiana per la Ricerca sul Cancro (to M.P.). ↵2 S.M. and M.B. contributed equally to this work. ↵4 Abbreviations used in this paper: HMGB, high mobility group box; RAGE, receptor for advanced glycation end product; FGF2, fibroblast growth factor-2; MAE, murine aortic endothelial; CAM, chorioallantoic membrane. Muller, S., P. Scaffidi, B. Degryse, T. Bonaldi, L. Ronfani, A. Agresti, M. Beltrame, M. E. Bianchi. 2001. New EMBO members’ review: the double life of HMGB1 chromatin protein: architectural factor and extracellular signal. EMBO J. 20: 4337-4340. Erlandsson Harris, H., U. Andersson. 2004. Mini-review: the nuclear protein HMGB1 as a proinflammatory mediator. Eur. J. Immunol. 34: 1503-1512. Yang, H., H. Wang, C. J. Czura, K. J. Tracey. 2005. The cytokine activity of HMGB1. J. Leukocyte Biol. 78: 1-8. Abraham, E., J. Arcaroli, A. Carmody, H. Wang, K. J. Tracey. 2000. HMG-1 as a mediator of acute lung inflammation. J. Immunol. 165: 2950-2954. Degryse, B., T. Bonaldi, P. Scaffidi, S. Muller, M. Resnati, F. Sanvito, G. Arrigoni, M. E. Bianchi. 2001. The high mobility group (HMG) boxes of the nuclear protein HMG1 induce chemotaxis and cytoskeleton reorganization in rat smooth muscle cells. J. Cell Biol. 152: 1197-1206. Huttunen, H. J., C. Fages, H. Rauvala. 1999. Receptor for advanced glycation end products (RAGE)-mediated neurite outgrowth and activation of NF-κB require the cytoplasmic domain of the receptor but different downstream signaling pathways. J. Biol. Chem. 274: 19919-19924. Taguchi, A., D. C. Blood, G. del Toro, A. Canet, D. C. Lee, W. Qu, N. Tanji, Y. Lu, E. Lalla, C. Fu, et al 2000. Blockade of RAGE-amphoterin signalling suppresses tumour growth and metastases. Nature 405: 354-360. Park, J. S., D. Svetkauskaite, Q. He, J. Y. Kim, D. Strassheim, A. Ishizaka, E. Abraham. 2004. Involvement of Toll-like receptors 2 and 4 in cellular activation by high mobility group box 1 protein. J. Biol. Chem. 279: 7370-7377. Salmivirta, M., H. Rauvala, K. Elenius, M. Jalkanen. 1992. Neurite growth-promoting protein (amphoterin, p30) binds syndecan. Exp. Cell Res. 200: 444-451. Carmeliet, P., R. K. Jain. 2000. Angiogenesis in cancer and other diseases. Nature 407: 249-257. Naldini, A., A. Pucci, C. Bernini, F. Carraro. 2003. Regulation of angiogenesis by Th1- and Th2-type cytokines. Curr. Pharm. Des. 9: 511-519. Voronov, E., D. S. Shouval, Y. Krelin, E. Cagnano, D. Benharroch, Y. Iwakura, C. A. Dinarello, R. N. Apte. 2003. IL-1 is required for tumor invasiveness and angiogenesis. Proc. Natl. Acad. Sci. USA 100: 2645-2650. Bernardini, G., D. Ribatti, G. Spinetti, L. Morbidelli, M. Ziche, A. Santoni, M. C. Capogrossi, M. Napolitano. 2003. Analysis of the role of chemokines in angiogenesis. J. Immunol. Methods 273: 83-101. Sparatore, B., M. Passalacqua, M. Patrone, E. Melloni, S. Pontremoli. 1996. Extracellular high-mobility group 1 protein is essential for murine erythroleukaemia cell differentiation. Biochem. J. 320: 253-256. Belleri, M., D. Ribatti, S. Nicoli, F. Cotelli, L. Forti, V. Vannini, L. A. Stivala, M. Presta. 2005. Antiangiogenic and vascular-targeting activity of the microtubule-destabilizing trans-resveratrol derivative 3,5,4′-trimethoxystilbene. Mol. Pharmacol. 67: 1451-1459. Dong, Q. G., S. Bernasconi, S. Lostaglio, R. W. De Calmanovici, I. Martin-Padura, F. Breviario, C. Garlanda, S. Ramponi, A. Mantovani, A. Vecchi. 1997. A general strategy for isolation of endothelial cells from murine tissues: characterization of two endothelial cell lines from the murine lung and subcutaneous sponge implants. Arterioscler. Thromb. Vasc. Biol. 17: 1599-1604. Knoll, A., S. Schmidt, M. Chapman, D. Wiley, J. Bulgrin, J. Blank, L. Kirchner. 1999. A comparison of two controlled-release delivery systems for the delivery of amiloride to control angiogenesis. Microvasc. Res. 58: 1-9. Carmeliet, P.. 2000. Mechanisms of angiogenesis and arteriogenesis. Nat. Med. 6: 389-395. Chi, J. T., H. Y. Chang, G. Haraldsen, F. L. Jahnsen, O. G. Troyanskaya, D. S. Chang, Z. Wang, S. G. Rockson, M. van de Rijn, D. Botstein, P. O. Brown. 2003. Endothelial cell diversity revealed by global expression profiling. Proc. Natl. Acad. Sci. USA 100: 10623-10628. Leali, D., P. Dell’Era, H. Stabile, B. Sennino, A. F. Chambers, A. Naldini, S. Sozzani, B. Nico, D. Ribatti, M. Presta. 2003. Osteopontin (Eta-1) and fibroblast growth factor-2 cross-talk in angiogenesis. J. Immunol. 171: 1085-1093. Schlueter, C., H. Weber, B. Meyer, P. Rogalla, K. Roser, S. Hauke, J. Bullerdiek. 2005. Angiogenetic signaling through hypoxia: HMGB1: an angiogenetic switch molecule. Am. J. Pathol. 166: 1259-1263. Eliceiri, B. P., R. Klemke, S. Stromblad, D. A. Cheresh. 1998. Integrin αvβ3 requirement for sustained mitogen-activated protein kinase activity during angiogenesis. J. Cell Biol. 140: 1255-1263. Klein, S., A. R. de Fougerolles, P. Blaikie, L. Khan, A. Pepe, C. D. Green, V. Koteliansky, F. G. Giancotti. 2002. α5β1 integrin activates an NF-κB-dependent program of gene expression important for angiogenesis and inflammation. Mol. Cell. Biol. 22: 5912-5922. Okamoto, T., S. Yamagishi, Y. Inagaki, S. Amano, K. Koga, R. Abe, M. Takeuchi, S. Ohno, A. Yoshimura, Z. Makita. 2002. Angiogenesis induced by advanced glycation end products and its prevention by cerivastatin. FASEB J. 16: 1928-1930. Treutiger, C. J., G. E. Mullins, A. S. Johansson, A. Rouhiainen, H. M. Rauvala, H. Erlandsson-Harris, U. Andersson, H. Yang, K. J. Tracey, J. Andersson, J. E. Palmblad. 2003. High mobility group 1 B-box mediates activation of human endothelium. J. Intern. Med. 254: 375-385. Palumbo, R., M. Sampaolesi, F. De Marchis, R. Tonlorenzi, S. Colombetti, A. Mondino, G. Cossu, M. E. Bianchi. 2004. Extracellular HMGB1, a signal of tissue damage, induces mesoangioblast migration and proliferation. J. Cell Biol. 164: 441-449. Frantz, S., K. A. Vincent, O. Feron, R. A. Kelly. 2005. Innate immunity and angiogenesis. Circ. Res. 96: 15-26. Yuan, K., T. M. Hong, J. J. Chen, W. H. Tsai, M. T. Lin. 2004. Syndecan-1 up-regulated by ephrinB2/EphB4 plays dual roles in inflammatory angiogenesis. Blood 104: 1025-1033.